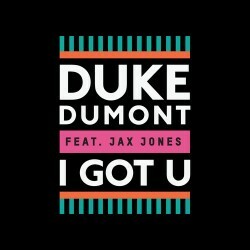 Duke Dumont's killer summer jam, "Need U (100%)," was awarded a Grammy nomination for best dance record Friday and what better way to prove to not only the Grammy's, but all the dance music fans that he is well deserving of this high honor with the release of an AMAZING new track, "I Got U" feat. Jax Jones (Annie Mac Special Delivery Radio Rip). This song emulates happiness and surrounds your ears with warm vocals and melodic piano like a snowstorm of beauty. So good that the best curly head of hair in dance music, Annie Mac, premiered the song, replaying the tune half way though because she couldn't get enough. Duke Dumont creates a calming vibe with a low steady beat, weaving piano between steel drums and Jax Jones' beautiful voice. With the Grammy's swiftly approaching, I wish Duke Dumont nothing but the best of luck and hope he walks away from the night in a penguin suit and gold record player in hand. "I Got U" will be a massive tune in the next year and hope to see more amazing music by this quality producer.